The Church’s worst nightmare. Love never fails. The author exposes the hidden and outrageous world of a budding Catholic institute. A discarded insider and captive in an apartment near Rome, the once broken priest with suicidal tendencies survives. He shares his ordeal and bares his soul with raw sincerity. In 1979, an idealistic and naïve Sullivan leaves California and joins a wannabe religious order named Miles Jesu. Two tragic but unclear realities threaten his future. The young man has a condition that retards the proper development of his emotional life. The eighteen-year-old unwittingly joins a cult. These two menaces trigger gradual human destruction. Life deteriorates into a victim’s futile attempts to endure a virtual sociopath. Then a miracle of overwhelming love bursts in the soul of Father Sullivan. Secrets of the power of love, Jesus’ love transform him. All hell breaks loose. Breakneck emotional development surges. His only path to human salvation is to escape into the Vatican and face his worst fears. He must risk his future and unmask the cult to seize his freedom. Sullivan must face the consequences of feeling divine and human love for the first time. Vatican Intervention advances fresh outlooks on universal themes: love, prayer, risk taking. This incredible love story of Church tragedy and hope underlines the existential nature of receiving love. It reveals the surprising impact therapeutic meditation can have on human emotions and their growth. Superbly written, the story reflects Capote’s feel of real and Grisham’s page-turning narrative. While documenting a true testimony, it reads like compelling fiction. This testimony is an ideal follow up story to Spotlight: The Boston Globe’s Pulitzer Prize-winning coverage of sexual abuse in the Catholic Church. Yet, Vatican Intervention shows blinding light at the end of the tunnel. This book is especially suited for Christians and Catholics. It offers insight about church scandals and shares an epiphany of hope for anyone harmed by them. Bishops, priests, ministers, religious, seminarians, students, and church worshipers can discover enlightenment, healing, and the transforming power of love within its pages. Above all else, this is a book for anyone who has hit rock bottom in life. 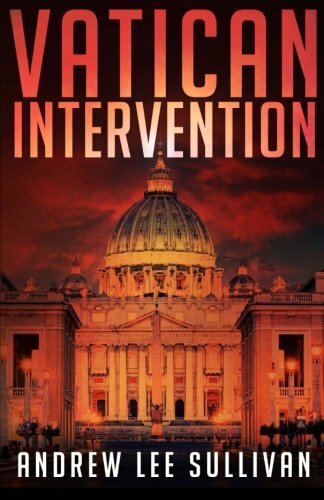 Vatican Intervention is being adapted into a major motion picture by producer, Mario Domina of ThunderBall Films, Ltd. The original screenplay adaptation will be written by Brian L. Porter, author, screenwriter, and co-producer. Andrew Lee Sullivan will contribute as the co-writer and associate producer for the project. Andy Sullivan’s story is gripping, illustrative, harrowing and hopeful. He was an American founding member of Miles Jesu, another one of the “New Religious Movements” that blossomed in the Catholic Church in the 1960’s around the time of the II Vatican Council. Some of these were decidedly maverick. Very well written, entertaining, a real love story, a tale of abuse, survival and vindication. It contains one bad guy and many good guys, innocent recruits that the charismatic “Fr. Duran” hauled in his wake as he created a (another) movement to save the Catholic Church from itself. Sullivan’s survival tale is remarkable because it describes being drawn into an abusive group, coping with that, falling into despair, struggling with celibacy, reporting the group to the dioceses of Rome, getting free and finally being able to marry the love of his life. When Sullivan, who had been one of the order’s chief fundraisers, became disenchanted and began questioning he was punished in several ways, including being placed under “house arrest” in Ostia, Italy. Very insightful is Sullivan’s discovery of his Affective Deprivation Disorder. What is really surprising is how Sullivan finds a spiritual path to recovery in the midst of mental and emotional chaos. The book is worth the price for this element alone. Find out for yourself. Another unique feature is Sullivan’s detailed description of his complicated dealings with authorities in the diocese of Rome (Vicariate) and at the Vatican (Congregation for Religious and Lay Institutes, Congregation for the Clergy) as he reports the chaotic environment he has been living in and then tries to get free from Miles Jesu and, after psychotherapy and much soul searching, seeks a dispensation from priestly celibacy. He describes the steps Roman authorities took to rein in the maverick institution. Steps and interventions similar to the Vatican intervention of the Legion of Christ 2010-2014; the Vicariate appears to have been more effective but ultimately the measures peter out in the same way as with the Legion when high Vatican powers decide to “save” the institution instead of going deeper with the surgical knife or abolishing it outright. Fortunately, at the end of the story the lovers are reunited, get married in the Ukraine, have children, return to the USA and live happily -if modestly- ever after.